Hamlet: to go or not to go? William Shakespeare’s epic-tragedy Hamlet will be USU Eastern’s final play of 2015 theatre season with guest director, Jarom Christopher Brown, mounting the impressive production. The cast is made up of eight actors, many playing multiple roles. Three freshmen play iconic roles: Adam Bone, a graduate of Carbon High School plays Hamlet; Victoria Tita, Maple Mountain High School, plays Ofelia; and Tasia Roche, Desert Hills High School, plays Gertred. 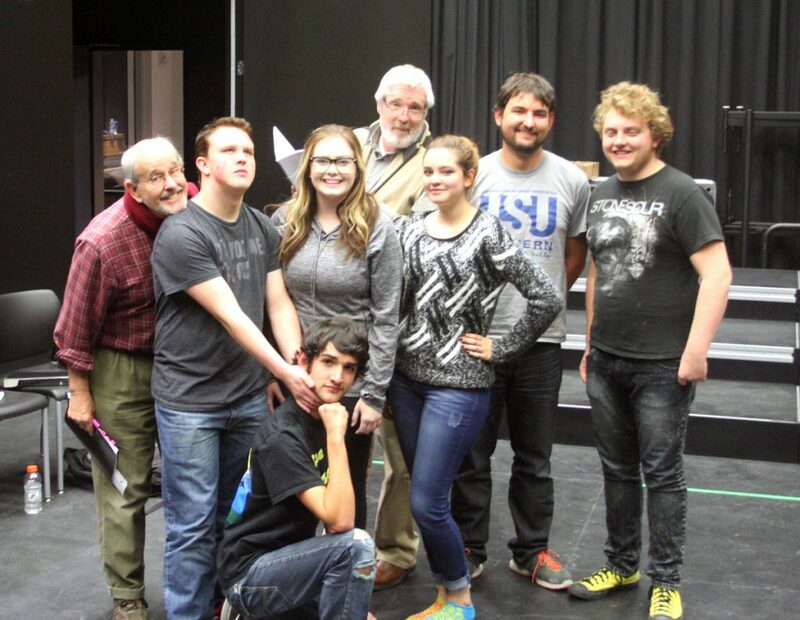 Other cast members include Chloe Clark, Stansbury High School; Josh DeMie and Josh Bone, Carbon High; Corey Ewan, USU Eastern associate professor; and Jerry Hoffman, Hollywood, Calif., professional actor; round out the cast. “Our acting muscles are certainly getting a work out,” noted Ewan who is playing both Claudius and the Ghost. Rehearsals have been fun, frustrating and enlightening. A quarto is a book where eight pages are printed on a single sheet of paper, folded twice to form four leaves. The average quarto contains about 100 pages, and is about 6 3/4 x 8 1/2 inches in size. Before the publication of the First Folio in 1623, 19 of the 37 plays in Shakespeare’s canon appeared in quarto format. They believed that most of the quartos in circulation had been either stolen outright by unscrupulous printers who plagiarized the official prompt-books belonging to Shakespeare and his company or they had been horribly reconstructed from the memory of people who had seen the plays performed. Heming and Condell were right to be concerned about the integrity of Shakespeare’s great works. The flaws in some of the quartos are wretched, according to a Shakespeare Internet site. “It is indeed different, but I believe that the scenes get to the point more quickly,” Ewan said. Having the opportunity to see this production in the Peterson Black Box will be exciting. The audience will be seated on either side of the playing space, which will be like a runway. The challenge, again is to be certain the audience is involved and a part of the experience. Hamlet opens Dec. 3-5 (matinee on the 5), and also Dec. 10-12. As tickets will go fast, please arrive early. Curtain time is 7:30 p.m. Ticket prices are $10 for adults, $7 for seniors, $5 for faculty, staff, and non-USUE students, USUE students with a current activity card is $1. This is an exciting play, with great speeches, sword fights, ghosts, and deaths and, “to be or not to be . . .” in answer to that, yes, you should be there. We’ll see you anon.